Here are some facts about HMS Victory. 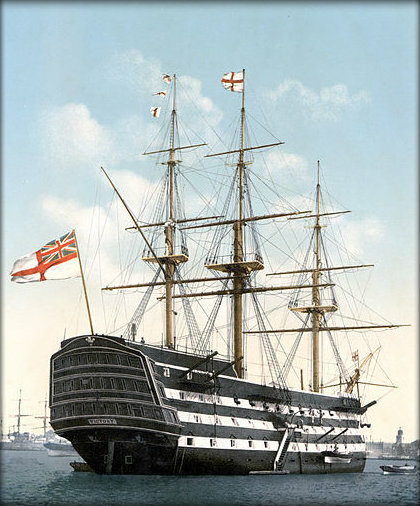 HMS Victory was one of the most famous ships of the British Royal Navy. She was the flagship of Admiral Nelson at the decisive 1805 Battle of Trafalgar, during which Nelson was killed. Construction began on the ship in 1759, although it took several years for her to be completed. The name was chosen to commemorate several recent British naval victories. HMS Victory is the only surviving ship to have fought in the Napoleonic Wars, the French Revolutionary War and the American War of Independence. HMS Victory was originally fitted with almost 100 powerful cannons. Today, only one of these cannons is still on the ship, as the weight of them all would damage the ship in dry dock. The ship measured just over 277 feet long and was about 50 feet wide. It could accommodate 830 men, most of whom lived in uncomfortable and cramped conditions. The crew drank wine and beer instead of water, which went bad. The crew did eat meat but it was often very tough and hard as a result of being stored in large salt barrels. The ship had 3 tall masts, each of which was made from sections that overlapped. They were as much as 3 feet wide at the base. The wood came from trees from Norway or eastern Europe. The HMS Victory was able to sail with 37 sails flying, with a total surface area of about 5,400 square yards. It could sail at about 10 mph – fast for its day. About 26 miles of rigging was needed on HMS Victory. Almost 800 pulley blocks were used to operate the rigging, as well as lowering and raising the anchor. The HMS Victory was placed in dry dock in Portsmouth, England – the oldest dry dock in the world – in 1922. Renovation work on the ship continues to this day.